The garden allegory reminds us of the need for water and sunshine for plants to grow. A heart-based education also requires its own form of water and sunshine. We liken these essential needs to storytelling in the environment of warm relationships. The first steps of creating a successful homeschool environment is to establish a routine for daily storytelling and to build and nurture healthy relationships with your children. ​Just as parents provide essential nutrients to their children by offering three meals a day, we recommend a schedule that includes three story periods each day. We believe that stories of faith, stories of history, and stories of nature along with other classical stories are essential for a heart-based education. Private schools and educational co-ops may include one or two story periods during the day to help families provide these educational essentials. All families are encouraged to enjoy a bedtime story routine, even when sending their children away to school for the day. ​Parents and teachers can enhance story time by including all five elements of heart-based learning. 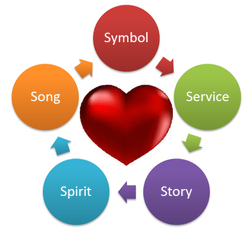 ​Click here to learn more about the five elements. New to Homeschooling? Help your family ease into this new schedule by devoting your first month to establishing a routine of three story-periods a day along with family chores and play time. After the routine is established, you can add other subjects of interest. What if my children don't want to sit and listen to a story? Holding still and listening to a story may be difficult for children, especially if this is a new routine. You may want to consider a quiet activity that children can do with their hands during story time such as coloring a picture, loom knitting, crochet, legos, etc. An activity with relaxing rhythmic movements may be especially helpful to increase attention and listening time.